Stone can range from indigenous (locally handpicked & mined) to stones imported from foreign countries. Wilen Masonry has used stone from quarries in Montana, Colorado, Minnesota, Wisconsin and Indiana. We have also worked with stone imported from Canada, Mexico, and Italy. Wilen Masonry, Inc. has worked on a wide range of stone projects such as… stone walkways, large and small masonry fireplaces, stone veneers, gas fireplace faces, patios and sidewalks, outdoor kitchens, fire pits, signs, kitchen hoods, interior columns, bar fronts, waterfalls, hand carved fireplaces, seating and privacy walls, store fronts to whole house veneers, used 1500lb stones in fireplaces, set a 1700lb hearth stone to appear to have no support, repaired old stone buildings and much more. 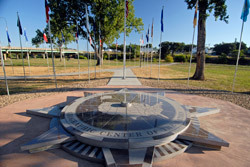 Wilen Masonry, Inc. is also proud to have been a part of creating the Center of the Nation Monument, located in Belle Fourche, SD. Wilen Masonry, Inc. was selected to work on an unusual monument at Devils Tower, Wyoming called The Wind Circle (Circle of Smoke), where we set and carved 2 very large stones donated from Crazy Horse Memorial. The base stones hold a large black marble block which holds the Italian Carrara marble sculpture designed and carved by Junkyu Muto. Thick wall veneer +/- 6"
Wilen Masonry, Inc. is trusted all over the region to provide quality masonry work including fireplaces, EIFS and brickwork.